Celebrate culture and cooking, historic meals and markets, and moments in our lives that we mark with food—as well as the ingredients that we have discovered and shaped over the course of thousands of years. As the exhibition Our Global Kitchen: Food, Nature, Culture takes visitors on a journey of growing, transporting, cooking, eating, and celebrating food. It also examines contemporary issues of environmental and human health, food security, and feeding the world’s growing population today and tomorrow. Jane Austen certainly ate ices at Godmersham. In a letter written to her sister Cassandra dated July 1st, 1808 she wrote about forgetting the cares of their normal homely domestic parsimony (“The Orange Wine will need our care soon”) instead of enjoying a rich man’s more sophisticated pleasures. But in the meantime for elegance & ease & luxury . . . I shall eat ice, drink French wine, and be above this vulgar economy. Here, I had the chance to talk to one of the curators of this exhibit, Dr. Eleanor J. Sterling, director of the Museum’s Center for Biodiversity and Conservation (CBC) at the Museum of Natural History. The museum of Natural History is truly unique in its scope of exhibits. Why did you choose the author Jane Austen for this exhibit? Our concept for this particular exhibit was to explore the intersection of food, culture, and health through meals eaten by iconic people, past and present. We sifted through a long list of fascinating figures, searching for cases where we could tell a poignant story that could both carry an interesting message and be visually powerful. Jane Austen’s story emerged because she is a fascinating and beloved author, and her documented appreciation for ice cream allowed us to explore the history of frozen foods prior to electricity and refrigeration, with some delightful surprises along the way. 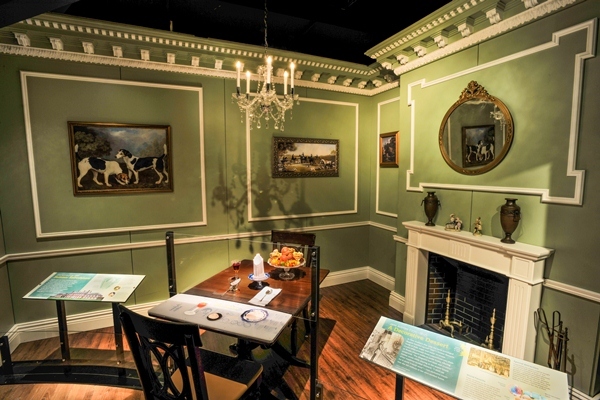 How did you pick the pieces that you have on display in the Jane Austen room? The table, chairs, dishware and utensils in the Jane Austen room are all items that take direct reference to Godmersham Park House, which belonged to Austen’s brother Edward Knight during the 1800s. Jane Austen often visited the lavish estate where ice was stored and consumed, and reflects upon these experiences through letters. The chairs and table in the display reflect the Rococo style, which was very popular at the time in England. The movement can be characterized as an elaborately ornamental late baroque style of decoration that was most prevalent at this time. The style often incorporated undulating lines and curves as well as materials such as silver, porcelain, wood, and silk. Tell me more about the actual building of the ice house and any details? Storing food and drink at low temperatures is an ancient practice – the cold air of a natural cave or underground pit has long been used to preserve root crops or grains. Ice pits and houses were built in Mesopotamia 4000 years ago to store winter snow and ice and the Chinese were harvesting and storing ice by at least 1100 BC. By the 16th century, palaces, chateaux, monasteries, and estates in Europe, China, and the Middle East had ice houses. The exhibit text gives some fascinating details about how European ice houses of the time were built as sunken, shaded shelters that could keep ice that was harvested from lakes and ponds in the winter frozen into even the hot summer months. A vaulted domed roof covered a deep underground chamber and a layer of earth covered the roof for insulation. Some ice houses had a hatch on top, for pouring ice in, and entrances had both inner and outer doors to keep out warm air. We did not have room on the panel to note that straw was placed between layers of ice, to make the blocks easier to move. Finally, a drain at the bottom carried melted water away. She wrote Pride and Prejudice in the home her brother lived at in Godmersham Park. How do you think the ice house helped her writing combined with the setting? We know from her letters that Jane Austen enjoyed eating ice cream at her brother Edward’s estate – in the exhibit we quote from a letter she wrote to her sister Cassandra in 1808 about the sophisticated pleasures available while visiting him: “But in the meantime for Elegance & Ease & Luxury… I Shall eat Ice & drink French wine.” We also consulted with several Austen scholars on the text for the exhibit, to ensure accuracy and authenticity. We are unable to make a scholarly link between her writing of Pride and Prejudice or other works and the ice house per se, other than that from her letters we know she enjoyed relaxing at the estate with its luxuries – in this exhibit we sought to bring forth a little known aspect of her life as it relates to food. Do you have any interesting anecdotes or facts about them? While researching this exhibit, we learned that two centuries ago, ice cream was made in a pewter container placed in a wooden pail packed with ice and salt, which helped lower the freezing temperature of the ice as it melts, transferring energy from the ingredients in the container. From time to time, the container was opened and a tool called a spaddle was used to scrape ice crystals from the sides of the jar into the sweetened cream. French and Italian confectioners began opening shops that served ice cream in English cities in the 1700s, and frozen desserts showed up in English cookbooks around the same time – some popular flavors were fresh currant, damson plum, and “burnt” (caramel) ice cream. Our Global Kitchen: Food, Nature, Culture is at the Museum Of Natural History through August 11, 2013. For tickets, please visit www.amnh.org.